At its core, the Reminders app that iOS 5 introduces is a simple task-management utility, designed to look like a sheet of loose-leaf paper. It offers basic functionality for entering tasks and to-dos, mixing in geolocation fun for good measure. It’s not as fancy as various to-do list managers you’ll find in the App Store. Todo, Pocket Informant, and Smart Pad offer more features than what you’re likely to find in this built-in app. That said, Reminders provides enough basic functionality to satisfy iPhone, iPod touch, and iPad owners with less extensive task management needs. You can tell Reminders to alert you of a to-do at a set time or when you arrive or leave a specific location. To get started, tap the first empty row in the Reminders app to type in a new reminder; tap Return, and your new task is saved. Next to each task is a checkbox—tap it to complete your task. Tap an individual task to tweak individual settings for this entry. You can adjust the name of the task, when it’s due, if it repeats, its priority, and general notes on the task. 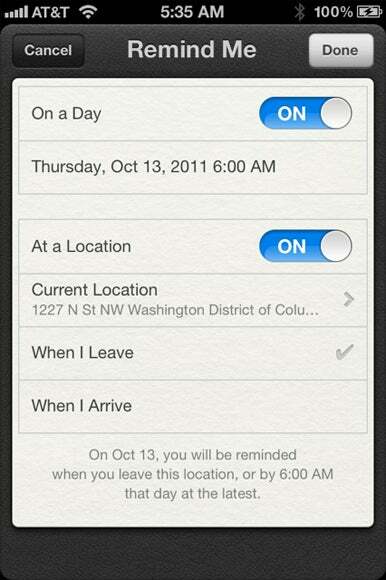 In addition, if you tap Remind Me, you can schedule time- and location-based reminders. As the name might suggest, time-based reminders are scheduled by time. Location-based reminders, in contrast, allow you to set a place (either your current location or a pre-specified address from one of your contacts), and whether you’d like to be reminded of the task when you leave or when you arrive there. The app will also let you set up recurring tasks. Tap Repeat, and you can schedule your task to repeat daily, weekly, every two weeks, monthly, or yearly. When you schedule reminders, they won’t show up on your iOS device’s calendar, though you can pull them up in iCal (they’re saved as Reminders there; as Tasks in other calendar programs). By default, Reminders displays your tasks in a simple list, sorted only by task entry time. A second viewing option—Date—lets you browse only those tasks with reminders set for a specific day. Again, those tasks are sorted by the time you entered them; if you add a task with an earlier due date (or higher priority) after a different task, the more-urgent task is still listed after the less-urgent one. If you want to remove a task, tap on it to enter the editing screen and then tap the Delete button, and, lastly, tap Delete a second time to confirm the deletion. You can also check off the unwanted task to remove it from your Reminders list. Reminders lets you create multiple lists. For example, you might use one list for grocery shopping and a second one for home-improvement tasks. On the iPad, the names of your lists remain visible at all times; iPhone and iPod touch users need to tap a Lists icon in the upper left corner to reveal their assorted lists. On the iPad, Reminders shows your various lists at all times. To create a new list, first tap the Edit button and then tap Create New List. If you’ve told your iCloud account to sync Reminders, you can choose whether each new list is device-specific or stored with iCloud instead. When you’ve created multiple lists, you can swipe sideways to flip through them on the iPhone. On the iPad, it’s possible to tap directly to the list from a sidebar. We've not yet met the iOS update that we wouldn't recommend, and iOS 5 is certainly the most far-reaching and feature-rich upgrade to date. That said, it's not without its bugs and strange behaviors. But it's clearly paving ground for a lot of key functionality in the future, and even a lack of polish shouldn't keep you from upgrading.